This page's sole purpose is to provide readers with interactive charts and graphics regarding South Africa's unemployment rate. The page will be updated periodically as more information regarding South Africa's unemployment rate becomes available. The bar chart below shows the latest unemployment rates per province and for South Africa as a whole, as well as showing the unemployment rates per province as measured in the 3rd quarter of 2018. So Limpopo has the lowest unemployment rate, closely followed by the Western Cape. At the other end of the spectrum the Eastern Cape had the highest levels of unemployment during Q4:2018 closely followed by the Free State. The summary below shows the inflation rate per province, from lowest to highest as recorded during Q4:2018. In this update we take a look at a short note released by Statistics South Africa regarding long vs short term unemployment in South Africa. The note published by Statistics South Africa below. "South Africa’s official unemployment rate is on the increase. In the past 10 years (2008–2018), the unemployment rate has increased from 21,5% to almost 28,0%. Unemployment refers to those persons who were not employed, had taken steps to look for a job or to start a business and were available to take up a job had it been offered. Now, the main hiccup lies with those persons who have been unemployed for longer periods and still do not find any form of employment. Long-term unemployment refers to people who have been unemployed for 12 months or more. The long-term unemployment rate shows the proportion of persons in long-term unemployment among all unemployed persons. According to the Quarterly Labour Force Survey, Q3: 2018, released by Statistics South Africa, 6,2 million South Africans are now unemployed, and 4,3 million of them have been unemployed for a year or longer. Between Q3: 2008 and Q3: 2018, the number of persons who were in long-term unemployment increased by 1,7 million, from 2,6 million in 2008. This has resulted in the proportion of persons in long-term unemployment increasing by 9,4 percentage points from 59,4% in Q3: 2008 to 68,8% in Q3: 2018. The most affected persons were women and youth. More men (51,4%) than women were unemployed in 2018 compared to 2008. However, the percentage of women who were in long-term unemployment was higher than that of men in both 2008 and 2018. Long-term unemployment affects the youth more than it affects the adults. Although the percentage of youth in long-term unemployment declined by 7,4 percentage points from 2008 to 2018, about two-thirds of those in long-term unemployment were youth (15–34 years) in 2018. Once a person has been in long-term unemployment, the probability of finding a job declines, leaving them at risk of being permanently detached from the labour market." Statistics South Africa reported that South Africa's unemployment rate for the 3rd quarter of 2018 came in at 27.5% which is close to the all time record high unemployment rate of South Africa. Not good news for those writing matric exams or those looking to finish their studies at the end of this year. The "Jobs summit"​ might need to be reconvened as this number will not please the governing party and with even state owned entities such as the SABC talking about retrenchments, how can government expect the business sector to keep employing new people during tough and sluggish economic times? The line chart below shows the official unemployment rate per quarter since the beginning of 2008. And the graphic shows, the trend over the last number of years have gone up steadily. Not inspiring any form of confidence in South Africa or its economy and its ability to address unemployment and poverty. No amount of talking and debating at a jobs summit will solve this problem. The only thing that will lift people out of unemployment and poverty is economic growth and job creation. And in order to do that the right policies, political programs and efficient government and efficient government spending needs to be in place to foster and maintain a environment in which businesses and individuals can flourish in. If the government is really serious about creating jobs and growing the economy, and not just looting state resources, the time to let go of policies such as land expropriation without compensation is now. In addition to this lower corporate taxes would free up money for companies to keep staff employed or to expand and employ additional staff, who will then be taxed and help to widen South Africa's tax base. If steps like these are not taken urgently, we see South Africa's unemployment rate reaching new record highs very very soon. The bar chart below takes a look at the employed vs unemployed in South Africa for the last 5 quarters. (Quarter 1 2017 to Quarter 1 2018). Note the employment and unemployment rates are on two different axis. But the pattern is clear, both the employment numbers and unemployment numbers remains fairly stable, In an ideal world, South Africa would like the bars for the employed to increase and the bar for the unemployed to decrease. The official unemployment rate in South Africa for the first quarter of 2018 came in at 26.7% , which is the same as the unemployment rate for the last quarter of 2017. According to the latest numbers published by Statistics South Africa there are 16.37million people employed (in both the formal and informal sector of South Africa) while there are 5.98million people that are unemployed in South Africa. South Africa also has 15.3million people that are not economically active (that is they are of legal working age but not working at all). Of the 15.3million that are not economically active, 2.78million people are discouraged work seekers. Discouraged work seekers are those that want to work but cannot find work, but are looking. The rest of the 15.3million not economically active, i.e. the 12.5million people are grouped under (other). This includes kids that are in school as well as those studying, and those choosing not to work and not actively looking to work (think stay at home moms). In today's update we will not be looking at the actual unemployment rate expressed in terms of percent, but we will look at actual raw numbers. Just how many people are unemployed in South Africa as a whole, and in all the provinces. The bar chart below shows the number of unemployed per province. And the pie chart following the bar chart shows the contribution each province makes to the overall number of unemployed people in South Africa. As the bar chart above shows, Gauteng has by far the most number of unemployed people in South Africa, with 2.54million people in Gauteng sitting without a job. KwaZulu-Natal is in 2nd place with 1.74million people in KwaZulu-Natal sitting without a job. In third place is the Eastern Cape with 1.13million people in the Eastern Cape not having a job. 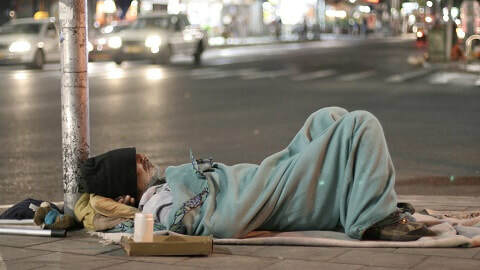 For the country as a whole, there are 9.216million people in South Africa without a job. And note this is based on the expanded definition of unemployment. (I.e the numbers reported here includes those who have completely given up looking for work). We are reporting these numbers as this gives a truer reflection of the real unemployment problem in South Africa. If we reported the stricter number of unemployed (which excludes those who have given up looking for work), the number of unemployed as at the end of 2017 would be sitting at 5.88million. So the difference between the strict definition and expanded definition of unemployment is 3.34million people. What that means is that an additional 3.34million people is not only without a job but has completely given up looking for work if one looks at the expanded definition of unemployment compared to the stricter version of unemployment. Conveniently for government the official unemployment rate is calculated using the stricter definition of unemployment (and the current unemployment rate is sitting at 26.7%). If the expanded definition of unemployment was used South Africa's unemployment rate would be sitting at 36.3% and not the 26.7% that is currently being reported. South Africa's unemployment problem is far worse than what government would have us all believe. The pie chart below shows the contribution to the total number of unemployed (using the expanded definition) per province. The pie chart below provides a summary of the relative contribution of each province to the unemployment rate of South Africa, using the same data as in the bar chart above but representing it in a different format. The pie chart above shows that Gauteng, while being South Africa's smallest province in terms of surface area, but SA's biggest province in terms of population, is also the province that contributes the most to South Africa's number of unemployed. With 27.5% of South Africa's unemployed people staying in Gauteng. Only 2.4% of South Africa's unemployed people reside in Northern Cape (South Africa's biggest province in terms of land area, but the smallest in terms of population numbers). The graphic below provides a time series of the unemployment rate for various age groups, and from the graphic it is clear that youth and young adult unemployment rates are exceptionally high and does not bode well for South Africa's future as its actual working population (with all the experience and institutional know how) is getting older. The question regarding South Africa's youth unemployment rate (aged 15-24) is whether the unemployment rate is so high as the majority of this group is still in school or continuing their studies at higher education facilities? Or is there a lot of youths just out of school actually looking for work to support their families but they cant find jobs? In the 3rd quarter of 2017, 52.2% of youths between ages of 15-24 were seen to be unemployed. Young adults (aged between 25-34) had the second highest unemployment rate at 33.5%. This age group one would expect have finished their schooling as well as their higher education training such as Bachelors degrees. Yet a third of these young adults cannot find a job. Question is whether businesses are not creating enough jobs to absorb them, or are they not employable due to the level and quality of their education not meeting the demands and needs of employers? The line chart above clearly shows the older you are the more likely you are to have a job in South Africa. Clearly showing that experience does count for something. The interactive graphic below shows the unemployment rate of South Africa over time (up to the latest quarter available). And for the third quarter in a row it is holding out at historically high levels. For a third quarter in a row South Africa's official unemployment rate is sitting at 27.7%. 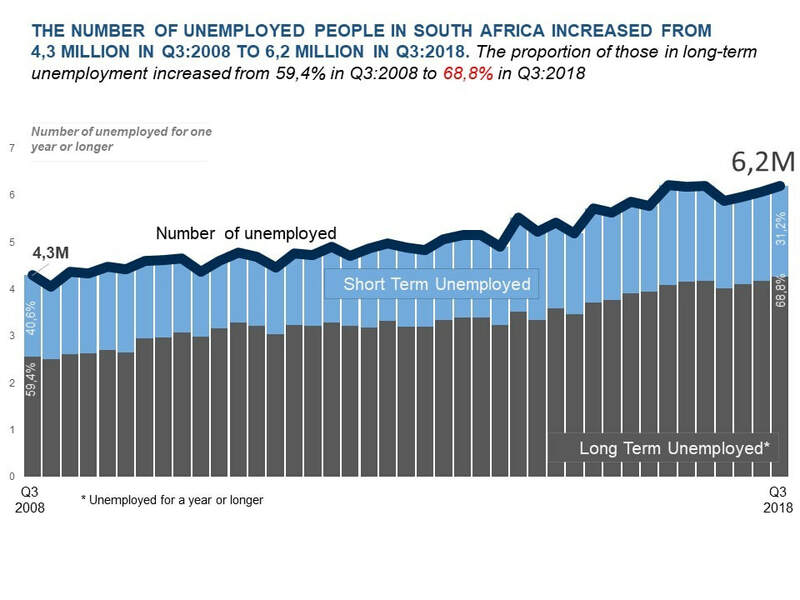 When looking at the expanded definition of unemployment (where those who are unemployed and have given up finding jobs), South Africa's unemployment rate is actually at 36.8%. Thats more than 1 out of every 3 people in South Africa sitting without a job. Concerning for South Africans should be the fact that the economy is growing exceptionally slowly (see our SA GDP page for more on South Africa's economy growth), and therefore not creating enough jobs to get those entering the labour market employed. See our education statistics page with regards to number of students obtaining qualifications. And this is leading to the ever increasing official unemployment rate. In years gone by there has been a massive influx of people into Gauteng, looking for jobs as it is the economic powerhouse of not only South Africa, but of Africa. But Gauteng's unemployment rat has been creaping up over the years. The graphic below shows the unemployment rate per province. The graphic below provides an overview of South Africa's unemployment rate per province per quarter up to Q3:2017. And as mentioned earlier with regards to people coming to Gauteng seeking employment the unemployment rate for Gauteng has been increasing over time as the province is not creating jobs faster than the number of job seekers in the province is growing. As at end of September 2017, the Eastern Cape has the highest official unemployment rate, while Limpopo has the lowest levels of unemployment. Gauteng which is the biggest employing province with 1.95million people working in the province, now have the 4th highest unemployment rate of all provinces (with roughly 819 000 people unemployed in Gauteng). Recently Statistics South Africa has started publishing unemployment rates per metro in South Africa. This lower level data provides useful insights into the performance of various of South Africa's biggest cities. We take a look at the unemployment rate per metro per quarter below. Nelson Mandela Bay in the Eastern Cape is the city with the highest official unemployment rate,with it sitting at close to 36%, while eThekweni, which has been the metro with the lowest unemployment rate since Statistics South Africa started publishing data on metropolitan level has given up its place as the city with the lowest unemployment rate to City of Cape Town, who now has the lowest unemployment rate of all metros in South Africa. Residents and businesses in the Eastern Cape must be concerned, as their two big metros are the two metros in South Africa with the highest levels of unemployment in South Africa. Car manufacturers leaving South Africa not helping their cause as the Eastern Cape is the car manufacturing hub of South Africa. The Western Cape has the highest level of labour absorption rate in the country, while the Eastern Cape has the lowest level of labour absorption rates in South Africa.